In the last 10 years, Gaza has endured three major wars, and they are on the brink of war for a fourth right now in 2018. This year, more illegal Israeli settlements have been placed on Palestinian land, angering Palestinians. Additionally this year, the relocation of the American Embassy to Jerusalem was another major event that occurred, stirring the already boiling pot. Gaza has suffered a lot, especially with the Great March of Return and the death of many innocent civilians. Moreover, Israel is not applying their policies in accordance with political decisions after the events of 1967. Israel also does not acknowledge Arabs who remain on the land which they believe does not belong to Palestine. Living in Gaza is hard because of the blockades placed around the territories by different political sects; getting out is hard, if not impossible. Gaza is also in extreme poverty due to the blockades; between the Israeli bombings and the poverty, people are obviously finding it hard to live. To make matters worse, Israel does not follow most rules set by international law. Palestinians are protesting more by the day, and clashes between Palestine and Israel continue to become more severe, resulting in political and economic clashes. Poverty caused by political and economic blockades. What the government wants is more important than what the people want. There is no proper infrastructure (sewage system is poor, and electricity is cut off from lack of capital). Child labor caused by the poverty of big families and early marriage. Israel forces prohibit fishing by the sea, which was a major part of Gaza’s economy. Houses are small, and families are big. Associations tend not to fully donate. Resources are scarce because of blockades from Egypt and Israel, and smuggling can lead to death. There is not enough food for livestock, and barely any food for people. The people of Gaza receive their health and educational services from the authorities in Ramallah. Social and governmental services are provided by these authorities. Recently, the Palestinian Authority, run by President Mahmoud Abbas, has cut Gazan’s job salaries down 40% because of political threats. Many workers were kicked out of their jobs because of the lack of government funding. Also, many aids made to Gaza have stopped due to multiple interferences made by the American president, Donald Trump. The #DignityIsPriceless campaign has been released in response to the rejections in funding. Find out more here. Public Opinion Poll #67 has also affected 1,000 people and 5,000 families were affected; over 200,000 people were also harmed because of indirect beneficiaries they would have received from certain funding. United Nations Relief and Works Agency for Palestine Refugees in the Near East (UNRWA) — UNRWA provides 90% of the food for Palestinian refugees in Gaza. They provide education and primary health services through worldwide funding from the United Nations. UNRWA built 24 clinics, 207 schools, and provides jobs for 13,000 employees. The Right to Live Society is a community-based center and non-profit organization that specializes in aiding people with Down’s syndrome in Gaza; you can find them on Facebook. For direct contact for volunteering or sending donations to various of the above associations, please contact Bilal Jhaish, a civil society expert in Rafah, Gaza, at +972 59- 946-1016. 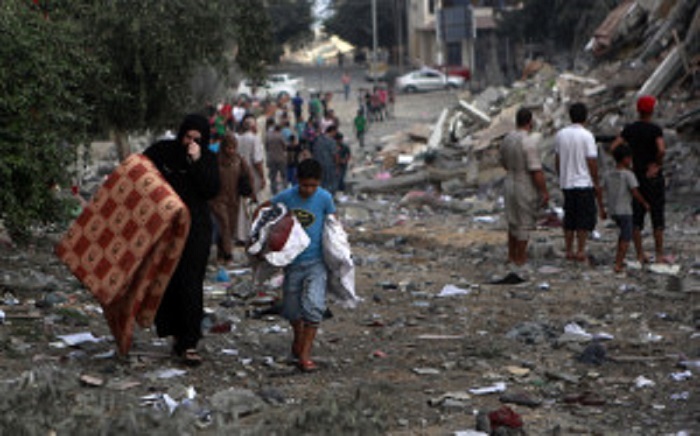 To gain a more in-depth understanding of the dire situation in Gaza, take a look here. Image courtesy of Photo: NRC/ Emad Badwan.